I mostly value investments according to traditional fundamentals, but I also use technical indicators to refine my entry and exit points. My previous articles asked, "is spot U3O8's bottom now in and are uranium investors ready?" They pointed to clues such as supply risks pushing the spot price up 14% in August to $32 per pound, after flatlining since the spring at 9-year lows of $28. The spot price then moved another $4 higher to $36 which held for a month, with its key $40 price level in sight. The $40 spot U3O8 level is key for me because it is where uranium prices had formed a lengthy support before breaking down sharply in mid-2013. The $40 level was also the only support that held as uranium prices plunged during the recession, after making all-time highs of around $137 in 2007. The $40 level held once again as commodities and stock markets pulled back in 2010. Key technical support levels often turn into resistance levels when finally broken down. I had expected the U3O8 spot price might bounce around the $35 level for a few months before attempting to breach such a key resistance level. Instead, spot U3O8 continued rising past $40 to as high as $44. From $28 in August to $44 mid November works out to +57%. For a commodity price that's a huge move in a short amount of time. Even with the recent 9% pullback to today's $40, I think we can say that uranium has finally made the turn. As lower-lows turn into higher-highs, we are now seeing more uranium articles with higher targets for both the commodity price and for shares of its miners. Action traders are now catching-up on uranium's catalysts, which I have been detailing for months. I'm not sure why the spot price had to pop 57% before more writers started noticing uranium again. I thought the point was to provide industry news and company updates with investment ideas that might affect future values—not just showing what already happened. So many articles lately talk about the big moves in U3O8 spot prices and uranium mining stocks as a surprise, a result of Japan approving two nuclear reactor restarts. IMO these approvals became a near 100% lock after July 16! While the herd is still early in uranium's long-term rebound, they could have seen this coming from $28 in early May until mid-August as I wrote about the public comment period and verifications anticipated after the NRA approved the upgraded design and safety features of units 1 and 2 at Sendai's nuclear plant. Licensing next steps and timelines indicated an October conclusion with restarts by early 2015, with 18 more reactors now in the restart approval queue. Japan's nuclear reactor fleet was the world's third largest consumer of uranium before Fukushima, and restarting some of these reactors is the near-term catalyst needed to spark uranium's rebound. As confirmed by the recent pop in the spot price, this is more a matter of investor sentiment returning favourably to uranium than the real reasons for its likely bull market. If not then uranium would have already rebounded as there are more reactors in the works today than before Fukushima happened. While sentiment is important, especially for short-term timing, growing global demand from next year forward is what will ultimately drive uranium's long-term renaissance. Japan with 48 operable reactors has had nuclear power since 1966, but is less important today than China which didn't have any reactors until the 1990's. According to the WNA, China already has 21 operable reactors, with 27 under construction, 60 planned and 120 proposed, or 228 potential reactors in China alone. Other key players with 10 or more nuclear power reactors are: USA with 100 operable and 27 in the works (100 + 27), France 58 + 3, Russia 33 + 59, South Korea 23 + 13, India 21 + 63, Canada 19 + 5, UK 16 + 11, Ukraine 15 + 13, Sweden 10. Even oil rich countries like Saudi Arabia and the UAE have 30 reactors in the works. Uranium demand is set to soar over the next 15-years as the number of reactors worldwide more than doubles from today's 437, with 557 more reactors already in the works. The bonus for uranium investors is that nuclear power plants cannot switch to other fuel sources like dirty coal, oil and natural gas plants can. If they could switch they wouldn't want to at even quadruple the uranium price as fuel is only a small percentage of overall costs compared to much higher capital costs and labour. Nuclear energy continues to be the most efficient, reliable, environmentally safe and low cost form of commercially available base-load electric power. These strong competitive advantages make me think of Warren Buffett's long-term "economic moat". The other bonus for uranium investors is that future supplies needed to keep up with growing demand have instead been constrained by extended low prices. I have written about several major uranium miners that have cancelled expansion plans or closed mines. The decision to reopen these mines is years away as most are not profitable at even double the current spot price. Also, funding any type of mining these days is difficult, which has compounded the decline in uranium exploration. 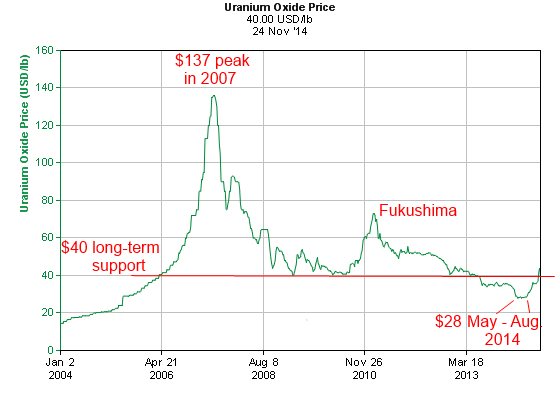 Secondary sources of uranium is the main reason prices have stayed this low, however they are disappearing fast. The U.S. had a 20-year supply of ~24Mlbs. per year of Russian HEU from recycled nuclear warheads, which ended last year. Commercial inventories from the early 1970's to early 2000's have been consumed, and supplies from Germany and Japan after Fukushima will be used up as more reactors start in Japan, China etc. Reprocessing spent fuel can only supply 3% to 4% of demand unless major investments are made, which requires lofty increases in long-term prices. UxCo expects secondary supplies to fall from 52.4Mlbs. in 2013 to 35Mlbs. in 2014, to 29.2Mlbs. by 2020. Markets eventually respond to higher demand, or lower supplies, with higher commodities prices, but it takes years for exploration and production to ramp-up again. Due to its radioactivity uranium is the most regulated type of mining, taking even longer for new supplies to kick in. Utilities that have held off purchases hoping for even lower uranium may instead propel prices higher as they scramble for inventory. With prices down so much for so long, possible severe supply shortages after next year could lead to uranium's bull market cycle going that much higher and lasting that much longer. The above chart clearly shows as a red-line the $40 long-term spot uranium support level, which held from 2006 until mid last year. It also shows the spot price bottoming at $28 from May to August this year, which I believe was confirmed as the price moved above $40 again last month. One might expect uranium miners to have also bottomed between May and August, however the following table shows that they actually got even cheaper as the spot uranium price started rising this fall. All of these listed stocks produce uranium or are developing a mine, except for (NYSE: URA) Global X Uranium which is an ETF that tries to duplicate the Solactive Global Uranium Index. While every company is different, ordered by market capitalization from $7.24 billion down to $51 million, I find it interesting that none of these eight stocks made their 52-week low with the spot price around $28, rather all but two bottomed around October 15 or November 5 as the spot moved from $35 to $39. From a low of +28% to a high of +119%, these uranium stocks moved an average of +62% from their mid-October or early November lows to their recent November highs. That's too far, too fast, so I held off on writing this report until a needed Fibonacci Retracement occurred, currently -8% to -25% or -17% on average. Below are brief company descriptions with recent news that caught my eye. (NYSE: CCJ)(TSX: CCO) Cameco Corp. is the world's largest publicly traded uranium miner with operations in many countries. CCJ is the largest producer in Canada's Athabasca Basin where its huge Cigar Lake mine recently started, and where strikes just ended at its McArthur River mine and Key Lake mill. CCJ is dealing with a potential $800M tax battle that investors are still trying to figure out. (AMEX: DNN)(TSX: DML) Denison Mines has exploration and development projects in Canada, Zambia, Mali, Namibia and Mongolia. DNN is at the top of my potential uranium takeout list as one of the largest players in the Eastern Athabasca Basin with over 470K hectares. DNN owns 60% of the Wheeler River project and high grade Phoenix deposit, and 22.5% of the McClean Lake JV deposits and mill. DNN's Q3 highlighted its summer drill program and high grade Gryphon Zone discovery. (AMEX: UEC) Uranium Energy's South Texas In-Situ Recovery (ISR) projects include the operating Palangana mine, permitted Goliad, and development stage Burke Hollow which recently reported a 77% increase in estimated uranium resource. All three projects will feed into its fully licensed Hobson processing plant. UEC also has advanced-stage projects in Arizona, Colorado and Paraguay. (AMEX: UUUU)(TSX: EFR) Energy Fuels has a producing mine, mines on standby, and properties in various stages in the western U.S. states. UUUU is America's largest conventional producer and its White Mesa mill is the only conventional mill operating in the U.S., with lots of capacity to expand. Recent Q3 financial results showed $3.1M in net income and increased working capital to $45.4M. (AMEX: URG)(TSX: URE) Ur-Energy operates the Lost Creek ISR uranium mine and facility in south-central Wyoming with a 2Mlbs. per year processing capacity. Since production started last year UUUU has sold $32.2M of over 600Klbs. at ~$52.95/lb., with a cash cost of ~$20.01/lb. before taxes and severance. URG also owns the past producing Shirley Basin mine and other projects in the state. (NASDAQ: URRE) Uranium Resources has two licensed and currently idled processing facilities and over 16K acres of ISR projects in Texas. URRE holds a federal NRC license to recover up to 3Mlbs. of ISR uranium per year from ~200,000 acres in the prolific Grants Mineral Belt in New Mexico, and has an extensive mining database for the Western U.S. URRE recently added ISR properties in South Texas and is planning a 2015 drilling program of up to 27Kft. on its Alta Mesa Este project. (AMEX: URZ)(TSX: URZ) Uranerz Energy is an emerging ISR uranium producer with ~73K acres in Wyoming's prolific central Powder River Basin (PRB), near major producers such as Cameco. URZ' first mine and processing plant is called the Nichols Ranch project, which started in April. URZ' Q3 highlights the 97Klbs. produced for the quarter and the company's first reporting of uranium sales. Revenue was $3.9M based on 75Klbs. sold, which works out to $52/lb. The average production cost was $26/lb., or a healthy 50% margin excluding taxes and royalties. Nichols Ranch is licensed for up to 2Mlbs. per year with costs expected to decline as daily recovery rates and operating efficiency continue to improve as production ramps up. Last month URZ announced the permit application for its third PRB mining unit, called Jane Dough, was deemed complete. This nearby mining unit will transfer uranium solutions to the processing plant via wellfields and pipelines, which will save URZ a ton of money, time and will extend the mine life.